Computers and laptops are an essential part of modern lifestyle. You’ll notice that our work, entertainment and day to day needs take us to these machines, therefore, it won’t be wrong if I say that if they had a thinking brain like humans and a tongue; they could easily tell about our personalities, our likes and dislikes. In other words, if we want to know someone better, we can do so by monitoring their cyber activities. Although it’s not ethical to spy on people and use their private information to blackmail them, however, it isn’t wrong to positively monitor the cyber inclinations of people around us and help and advise them accordingly for the sake of common good. 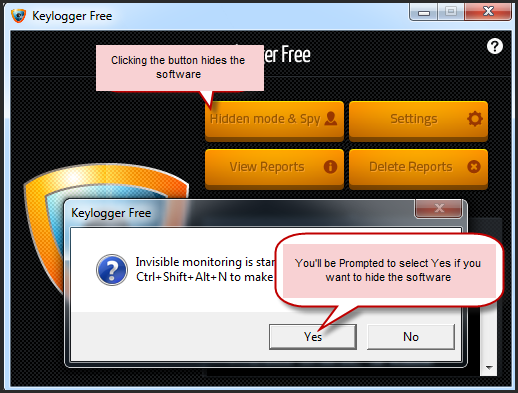 Keylogger Free can be used to monitor computer activities. It can be downloaded from its official website for free and you’ll be astonished to know that all of its amazing features. Once launched on your machine, it automatically keeps record of all the keystrokes as well as record website history and software used on the laptop/computer. You can install it on any computer and use it to keep that machine under surveillance. Keyloggers can be hardware or a coded utility that can be installed as software. Keylogging software belongs to that genre of tools that allow us to add value to our laptops and computers. Keylogger Free can save the activities carried on a computer in the form of a report with clear mention of time and date for every key pressed on the keyboard and every program opened on the computer. In this way you can exercise more control on your machine and know exactly when, how and why it was used. Keylogger is designed for Windows operating system and it runs smoothly without putting any unnecessary load on the processor. How Can You Benefit from Mornitoring Computer? Keylogger Free can also prove itself as an exceptional spy to let you know whether your employers are putting their energies towards success of your business during the work hours or not. It won’t be difficult for a boss to install Keylogger on every employee’s machine and let them know to be careful as their logs will be checked and fine will be imposed if someone is found to waste time on other activities during the office hours. We are familiar with various Parental Control features that are added to modern software, digital TV, phones and laptops. These features allow the parents to decide what their children can access over these services and what they cannot watch or read. However, it is a fact that nowadays children are smarter than the adults and they know their ways to manhandle the parental control features. You can use the Keylogger Free software and keep it running in the Hidden mode on those laptops and computers that are used by your children to know what they are up to. By seeing the log files generated by the freeware you can understand the interests of your children as well as know how they breach the parental controls. In my opinion you should not be harsh to the kids and rather help them in getting involved in healthy activities and gradually change their interests towards more positive things. Our mind is an interesting machine that keeps learning and unlearning things. Some people forget the password of some of their accounts on social media which makes them feel bad and they go through a painful time until they finally remember the forgotten information or helplessly choose to create a new account from scratch. By revisiting the old reports generated and saved by keylogger can serve as an aid here to recall a forgotten password. Therefore it can save many people from going through a depressing agony. In short, you can not only monitor computer activities with Keylogger Free software but also let your computer save a complete log of your keystrokes which might prove useful for you to recall something that you have forgotten. With the features that it provides in zero dollars cost – we can easily declare Keylogger Free as the best keylogging software. Let’s guide you through a little journey to make you familiar with its interface and provide you with a brief commentary on usage of Keylogger Free tool. Downloading and installing Keylogger free for windows will be as simple as counting 1, 2, 3. Below-mentioned features and options will help you monitor computer around like a pro. If you want to spy on someone you have to use the “Hidden mode & Spy” option. When you click this option you’ll be prompted that Spy mode will be enabled on clicking “Yes” and a Key combination will be displayed that needs to be pressed to bring the software back into visible mode. The default key combination for this purpose in Ctrl+Shift+Alt+N. In the “settings” you can select the desired time interval at which log files should be renewed. You can decide the logging time according to your specific requirements. A new log file will be made after the selected time interval has passed. For instance if you have selected “60” seconds then a log file will be saved after every 60 seconds. In the “settings” you can also change the key combination for bringing the software back to visible mode. There are two buttons available on the programs interface for dealing with the logs saved by the software. You can click the “View Reports” tab to open the log files. The information is presented in the form of a notepad file which includes the information for the keys pressed on the keyboard, URLs and names of programs run on the computer. Clicking the “Delete Reports” tab deletes the report.